Two people were killed and four others, including children, were injured in a head-on crash on the Pennsylvania Turnpike over the weekend. The wrong-way crash happened late Saturday night in Beaver County. State police say 76-year-old William Paxton, of Pittsburgh, was driving eastbound in the westbound lanes when he slammed head-on into a car driven by a man from Ohio. Both drivers died at the scene. Paxton’s wife was taken to the hospital with suspected serious injuries. A 40-year-old woman in the other vehicle was hospitalized, along with a 4-year-old boy. A 5-year-old girl was reportedly uninjured. Authorities say Paxton had traveled on the wrong side of the highway for eight miles before the accident happened. They don’t know why. 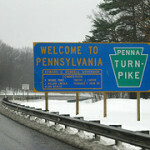 The post Wrong-Way Crash On Pa. Turnpike Kills 2, Injures Others appeared first on ButlerRadio.com – Butler, PA .